Want to turn on a lamp anytime you walk into a room? Don’t want to spend a lot of money or deal with fickle smart home hubs to make it happen. Sometimes the simplest solution is the best one, and the Westek MLC12BC-4 Indoor Plug-In Motion Activated Light Control is definitely the simplest solution. 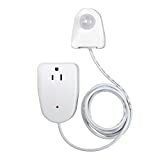 Plug your lamp into the device, plug the device into the wall, and mount the motion detector anywhere you want. Presto, you’re done!